Cactus water infused natural towelettes gently remove makeup, daily pollutants and everything you don’t want to sleep in without the use of water. Jojoba oil, in combination with aloe vera, makes these wipes gentle and highly effective. 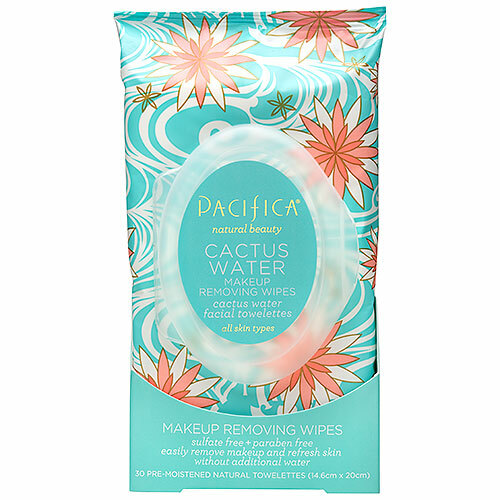 These wipes can remove most make-up, but due to the fact that Pacifica do not use chemical solvents, they will not remove the most water-proof make-up. They are a great follow-up to using a make-up remover as they will remove the residue from your skin leaving it refreshed. For all skin types. 100% vegan. Cruelty-free. Formulated without animal ingredients, petroleum, parabens and phthalates. The wipes are also made from natural viscose which is derived from pulp and are biodegradable. Aqua, Aloe Barbadensis (Aloe Vera) Leaf Extract, Cocos Nucifera (Coconut) Milk, Decyl Glucoside (Plant Source), Allantoin (Plant Source), Simmondsia Chinensis (Jojoba) Seed Oil, Citric Acid, Coconut (Cocos Nucifera) Water, Phenoxyethanol, Calendula Officinalis (Calendula) Extract, Chamamilla Recutita (Matricaria) Flower Extract, Cereus Grandiflorus (Cactus) Flower Extract, Polysorbate 20, Parfum (All Natural). Work the towelette in an upward circular motion on face and neck. 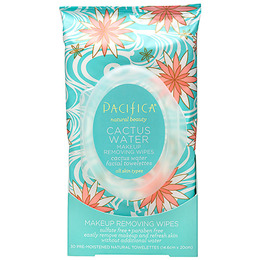 Below are reviews of Pacifica Cactus Water Make Up Removing Wipes - 30 Wipes by bodykind customers. If you have tried this product we'd love to hear what you think so please leave a review. Best cleansing wipes I have used. I have oily skin and wear mineral powder foundation and these cleaned my skin really well with just one wipe. I used a toner afterwards with cotton wool pad just to see how much residual make-up was left behind and could barely tell, so I guess two would give a super clean. Some wipes don't actually lift the dirt and make-up from your skin that well (and those that do are almost always too harsh, leaving the skin red and stinging) this can be obvious in the pores but not with these. However, they are so gentle, felt cool and soothing on the skin, my skin felt refreshed and as I was using I thought mmm... these just seem too gentle to be doing any good cleansing. I'm so glad I was wrong as it's so great to have found a facial cleansing wipe that does a good job without making my skin feel sore or uncomfortable. I'm not fussy for 'smells' in products, I'm more concerned with how the product actually performs than how it smells, but this smell on the skin is sumptuous! I'm seriously considering using these as a normal part of my skin cleansing routine to give my skin a break from foaming cleansers everyday as these cleanse so well. Highly recommend them for routine cleansing, travel and those late nights when you just want to get into bed but are too tired for a full routine! Cactus water infused natural towelettes gently remove makeup, daily pollutants and everything you don’t want to sleep in without the use of water.